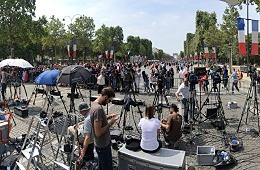 Overon supplied live broadcast services at World Cup. Madrid, July 2018: Overon deployed its own broadcast equipment for its coverage of two key world events this month: the final of the World Cup and the Trump Putin Summit in Helsinki. On Sunday 15th July saw the MEDIAPRO Group company, which specialises in technical broadcast services and audiovisual distribution, provide services for the final of the World Cup in Russia from three key points of interest: the Luzhniki Stadium in Moscow, with a team of 4 DSNG’s with 4 cameras and 4 back-pack broadcast systems; the Fan Zone in France, located in the Paris, with 2 DSNG’s with 4 cameras and 2 back-pack systems; and the Fan Zone in Croatia in Zagreb, with 2 DSNG’s with 2 cameras. 20 Overon staff took part in the production including satellite and camera operators and 80 live services were provided, in addition to working with a host of TV networks such as ARD and ZDF from Germany, TV5MONDE (France), TVP and PLTV (Poland), ORF (Austria), Al-Arabiya (Middle East), RTL (Netherlands), Channel One and Russia Today (Russia), BeIN SPORTS France and BeIN SPORTS Mena, Telemundo (USA), BBC, Televisa, IBS CGTN (China) and TVE. 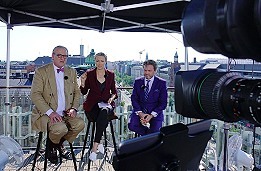 From Helsinki Overon provided broadcast coverage of the Trump-Putin Summit which took place on the 17th July in the Presidential Palace and the Congress Palace in Helsinki. For the coverage the company used 2 DSNG’s, 7 camera teams and 2 back-pack broadcast systems and a team of 8 staff who provided services for ABC News with 1 DSNG and 2 cameras and production services with 4 cameras and 2 back-pack systems for Bloomberg. They also provided live services for TVE news bulletins.